No, Not Everything is on the Internet. And No, Libraries Aren’t Antiquated. Between the continuing drama over the NYPL’s renovation of the 42nd Street building, the efforts to provide pop-up libraries for communities affected by Hurricane Sandy, author Terry Deary’s proclamation that libraries are “no longer relevant,” hype over that book-less library in San Antonio, and the Wall Street Journal‘s kind-of-weird-and-kind-of-awesome recent fascination with libraries, libraries have been a fairly consistent presence in my daily news feed lately. This past summer there was another little flurry of press about libraries, including in particular the raging NYPL debate and the spread of “little libraries.” I contributed one such article back in May, and in that article, I commented on an even earlier wave of “giddy attention” paid to little libraries. After I wrote my article, several others appeared (see this and this and this and this). And now some of those articles, or the projects featured in them, are re-appearing. At a time when digital information is replacing almost every kind of printed document, iPhones, iPads, Kindles and other similar portable devices have become books. Okay, we’ve heard this before. But I think we’ve also recognized that it’s not quite so simple. There are plenty of printed documents that haven’t been, and won’t be, digitized. And iPhones haven’t “become books”; they can hold books, among many other media forms, but the phones themselves aren’t books. It is hard to imagine the concept of a mobile library without immediately thinking of downloading its volumes from the Internet. Are books themselves not portable? Have we not read Benjamin? He must’ve moved those books before unpacking them, no? And what about bookmobiles? Mule libraries in Appalachia? Biblioburro? Traveling lighthouse libraries? Many people would regard it as an anachronism to think that a library could still have any relevance as an architectural typology in the face of the digital upheaval that has changed the ways we approach information and objects, transforming entire industries, such as the video, music and printing industries. <Sigh> Do we have to do this? How do you take something so opposite to a piece of architecture as a lorry and turn it into not just a library, but a structure capable of hosting an entire spectrum of cultural activities? Looked at in this way, the archaic idea of building libraries started to regain a sense of modernity. Working on this premise, Mexican architecture studio PRODUCTORA came up with the design for a cultural centre within a 20 square metres space on board a Freightliner M2 20K lorry — a travelling building. 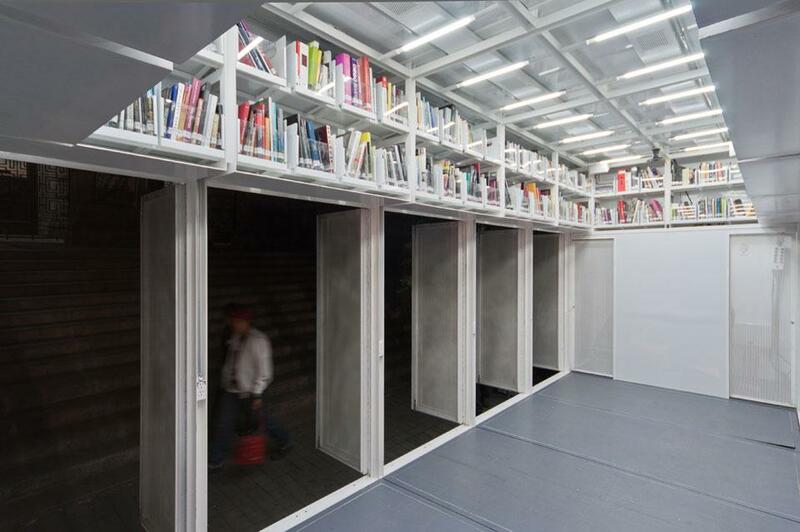 So Productora modernized the library by reimagining it as a site for an “entire spectrum of cultural activities”? Rather than heroicizing the designer, again, let’s give some credit to the librarians who already figured this out. The Carnegie libraries hosted an “entire spectrum of cultural activities” — as did, to some degree, the Library of Alexandria. Originally built to protect books from ruin, libraries are generally gigantic bunker-like buildings. Inwardly focused, they restrict access to their treasure troves to those who whisper and can thrive without sunlight. Maybe a hundred and fifty years ago that was the case — before Labrouste, before open stacks, before children’s rooms, etc. With the advent of the internet, however, all of the world’s knowledge is available instantly to anyone who desires it. All of it? Really? I bite my tongue. 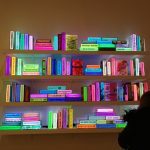 Books are no longer precious for the information within them, but rather for their physicality: you can’t hold the internet or turn a webpage (discounting the swipes of an iPad). This frees libraries to pursue another of their functions: to foster dialogue and investigation. Have not libraries been fostering dialogue and investigation for millennia? Sure, for a good portion of their history, when books were scarce and valuable, protecting the books was a prime concern. But that era ended quite some time ago — unless you’re talking about rare books libraries, which I don’t think they’re thinking of here. In short: Yes, I understand that you want to ascribe some historical and cultural significance to the design projects you’re reviewing — by suggesting, say, that a team of up-and-coming designers has revolutionized a thousands-of-years-old institution by proposing a new program and making it mobile; or by painting a really bleak picture of the status quo, to which your featured design offers an alternative — but let’s try not to fabricate that context.